After many visits to the city, I was missing one “standard” shot. So, I bundled up in layers and set out on the evening of December 30th (2010). I walked through the Old Town to the Vltava river, over to Little Quarter and Kampa Island, and crossed back over the Vltava again on the Charles Bridge to the eastern shore. I completely underestimated the cold, as I “rated” what I wore to be sufficient to about -5C/23F. As I discovered later, the air temperature was -10C/14F, even colder in the breezy windchill. By the end of my walkabout, my fingers were not happy at all. However, I was very satisfied with the photographs, one of which is shown below. 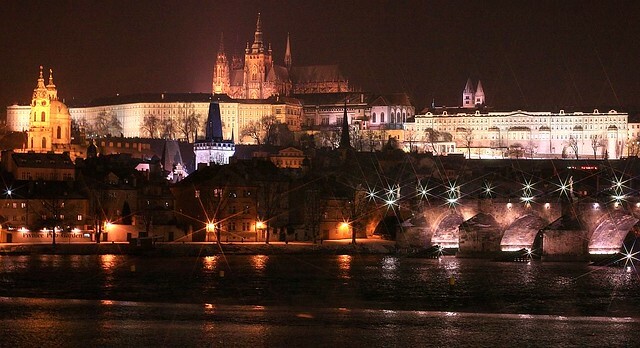 Northwest over the Vltava river, past Charles Bridge, towards the Castle – 30 December 2010. I made the photo above with the Canon EOS 450D camera, EF 50mm f/1.4 USM lens, and the following settings : 1/13s, f/2.8, ISO400, no tripod. This post is originally published on Fotoeins Fotopress (fotoeins.com). Thank you for your kind comment! There are many postcard-worthy shots to be found throughout Prague (e.g., https://fotoeins.com/category/europe/prague/), and I finally managed to snag a photograph with this view in particular. Are You alive at all? 🙂 Where is the hands shake? Even though it was cold, the tip here is to even out the breathing, and make a series of consecutive photos. For a moment, I was in mid-breath. Also, the other photos in the series are a little blurry. In other words, I was in fact alive, and my hands did shake – apparently. It wasn’t nearly that cold when we were out at night taking photos in Prague, but I was convinced I was going to get hypothermia! The wind-chill is killer. My hope is you got your own photos of the scene, or something similar to this, both day and night. It is a gorgeous shot! Well worth the effort. Hope you were able to get a hot drink to warm up the fingers afterwards! Hi, Anita. My fingers were happy after getting back inside. 🙂 Thanks for your kind comments! Hey, Lola. Thank you! I will tell you that it was cooolllld when I made that shot; I wrote in the post I found out afterwards the equivalent windchill was -10C/14F, and I’d been outside for a couple of hours. If the weather cooperates for you all, I hope you can make this shot, too! 🙂 Thanks again for reading and for your comment!